There are moments, flashes of them, sometimes strung together in a timeless sequence that I only wish I could recreate on demand. When I close my eyes sometimes they come back to me in a flashback. Like the moment I was moving along a ridge in the Wasatch Mountains on a moonlit path. All distractions melted away. Fatigue? Thirst? Pain? Gone. Bodily sensations and thoughts? Gone. At least for those few precious moments. In the Tibetan Buddhist tradition, the mind is like an elephant. Large and wild, easily distracted and not easily tamed. The monkey is distraction, unpredictable and elusive. The elephant follows the monkey, endlessly, always to different objects. This is mind wondering, which we all do. The monk, or meditator, follows in pursuit of the elephant, seeking to tame the beast. But the beast is large and unruly and is constantly chasing the monkey to different objects. Eventually, through much training and effort, the monk subdues the elephant, and is able to hold the elephant steady. The mind is at ease. 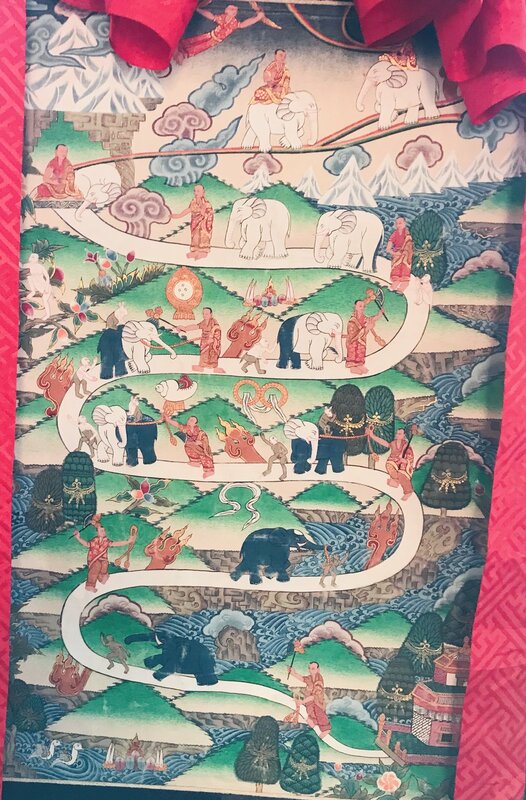 Then the monk begins to lead the elephant, and the monkey follows, and the mind is subdued and under control. Call me a mystic or want-to-be shaman, but if there is one thing that stands in the way of what we seek, it is the elephant. The large, wondering, undisciplined elephant. I think I best tame this beast.